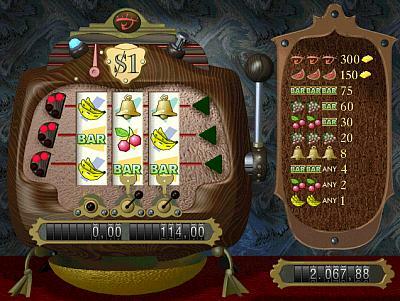 Hypervisual Century is a freeware digital slot machine for Windows with three reels and three paylines. It is a completely free software for you to download and play. This original and realistic machine goes beyond simple lever pulling: The ability to make multiple bets per payline, together with the reel lock feature, allow you to make strategic decisions that may lead you to your goal -- winning the jackpot! Hypervisual Century is also a tribute to the technological and design achievements of the 20th century. Click here to download the new version of Hypervisual Century! Click here if you receive the error message "This program requires at least 3MB of free virtual memory to run". Copyright � Hypervisual 1998-2009. All rights reserved.